External awnings are an excellent, economical way to shield your home and outdoor areas from the harsh sun. All Peachester awnings are available in a wide range of fabrics, colours and designs. The awnings can be used to shelter windows, alfresco dining areas, balconies, carports just to name a few. 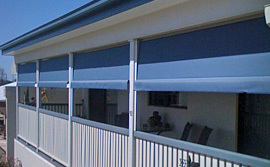 Peachester awnings are made to last, we use only quality fabrics and components and all of our channels and tracks are A Grade Australian powder coated. When you choose a Peachester awning, you not only get a beautiful product that will enhance your home but a product that will stand the test of time.